I am a wedding gown alterations specialist, who has since 1985 been making brides look "picture perfect" for their wedding day! "With over 32 years of dressmaking, designing and alterations experience behind me, you will receive the 'look and feel' of a custom fitted wedding dress!" As an alterations specialist... I have experience working with many types of fabrics, including beaded, sequence fabrics and laces. I have experience fitting various shapes and sizes. 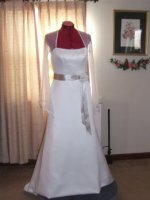 I am familiar with the latest wedding dress styles and construction methods used by wedding dress designers. I also have experience in altering “designer couture wedding gowns", which have more support systems built in them than the average bridal gown. This is where you need superb wedding dress alteration skills and a good working knowledge of designing and dressmaking are necessary for good results. By using my design and dressmaking skills, in combination with my alterations skills I can achieve the best fit for your figure while making sure adjustments made never detract from the design of the dress. It's imperative the two work together! "These are techniques most of the time only a wedding dressmaker or designer possess." I am a charter member of the Association of Sewing and Design Professionals, formally known as the Professional Association of Custom Clothiers, since 1991. This is an organization of sewing professionals who are committed to carrying out their businesses in a professional manner; while at the same time maintaining a high degree of excellence in their skills and in the quality of the services given to their clients. The goal of the association is to promote its members and to continually train them to follow a high code of ethics standard in their business practices, and also to achieve high standards in their skills in garment design and construction.